Jute shopper (39cm x 26cm x 19cm) or cotton tote (39cm 43cm 14cm). A unique collection of over 200 historic and more recent photographs, maps, and drawings of Oxhey. Charting the history of Oxhey from it’s origin as an enclosure for oxen owned by St Albans Abbey, through it’s growth to a small group of country manorial estates, and later it’s rapid expansion in Victorian times during the railway age up to the present day. Ted Parrish was a well-respected local historian and filmmaker who documented the many changes to the fabric of life of the area in word and film through the decades. He was also a committee member of OVEG for many years, as well as organiser of the annual Village Fayre. This new book is based on the 96 articles he wrote for the Thomson Organisation’s ‘Evening Post-Echo’ between 1982 and 1983. Leisure, entertainment, shopping, education, transportation, special events, VIP visitors, housing and education are just some of the areas he explores from memory from the 1920s onwards and from his own historical research. He reflects on what it was really like to live in this corner of Hertfordshire in decades gone by and recalls his childhood memories of a barnstorming flying circus at Leggatt’s Farm in the ‘20s, Bricket Wood fair in its heyday, magic lantern shows in Oxhey and a garden party in sculptress Mary Bromet’s garden. He remembers the crowds at Watford’s 1935 Silver Jubilee celebrations and at Bushey House where two landmark events took place in the mid-‘30s. Ted’s daughter, Lesley Dunlop, has added footnotes, readers’ letters and well over 200 illustrations, a significant number of which will be appearing in print for the first time. This 222-page book will be a sentimental journey for some and a true eye-opener for others. This 32 page book with illustrations in colour, tells the story of the coming of the railway. It includes new research on how the railway put Bushey (& Oxhey) on the map and was a vital component in the establishment of the Herkomer Art School that now forms part of Bushey’s unique history and cultural heritage. 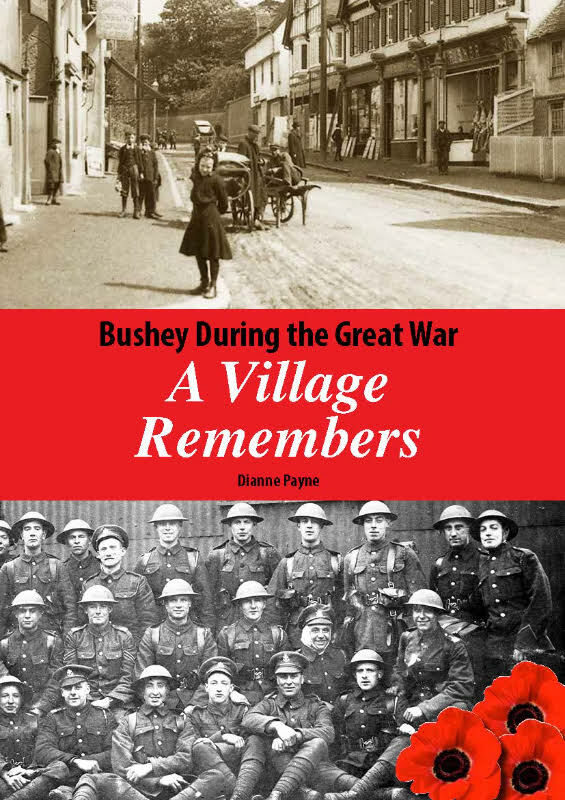 This book by Dianne Payne, Coordinator of the Bushey First World War Commemoration Project, is about the men and women of Bushey & Oxhey who served abroad and on the Home Front during The Great War. It includes the 50 panels from the exhibition held at The Bushey Academy in August 2014, a selection of biographies of local servicemen who gave their lives for their country and chapters reflecting on the years before and after the war. 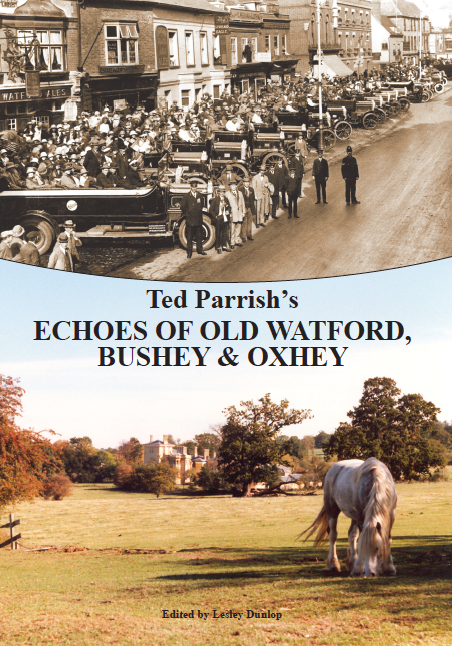 With 100 pages and fully illustrated in colour and monochrome, it provides both a souvenir of the exhibition and a colourful and poignant record of the social history of Bushey and Oxhey during the period. 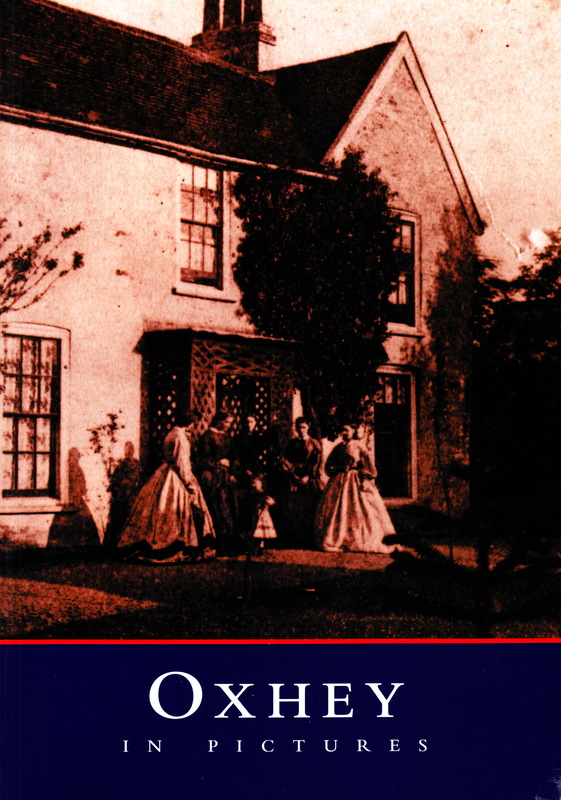 An historical account of the inns, hotels, taverns, pubs, alehouses and beerhouses which have served the people of and travellers through Bushey and Oxhey from earliest times to the present day. Together with some notes on the breweries which have supplied them and some observations regarding the Temperance Movement which opposed them, copiously supported by many photographic illustrations and a map.